You are an excellent player and Musician. ...So, why are you using below average strings? If you are reading this, then you most likely know your stuff when it comes to guitars and equipment. Nobody can pull the wool over your eyes when it comes to selecting a good guitar or amplifier. In fact, if you are like most good musicians, you own more than a couple of instruments. Now, let's think about something more specific to your sound. If you could improve one of those guitars with just one set of strings, would that be of interest to you? Professor String has just published a book about one of the most misunderstood components of the guitar: Strings. All sounds made by your guitar or bass start with the vibration of a string. Yet most guitarists overlook the basic principles of how to select the best strings for their playing style. They often start with a particular brand of string and stick with it forever. Or, they are constantly switching brands and never focus on anything specific to their playing goals. 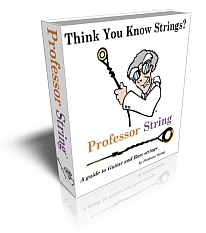 The facts about guitar and bass strings are being exposed for you in Professor String's latest e-book called "Think You Know Guitar Strings?" It has been written as a guide that helps both beginners and advanced players. You most likely have a fun guitar and great chops, but do you know anything about ASI? If not...here is your chance to learn about it. For the first time, someone has written a chapter about Advanced String Intonation (ASI). Very little has been written about ASI. No single book or guide has been published about this topic until now. Professor String has been consulted by many of the worlds top guitar and bass luthiers about ASI issues over the years. If you are reading this, and do not know about ASI, you are too good of a player to simply ignore it. In the present day era of advanced digital tuners, ASI has become more prevalent to your tuning. This is the only book you will find on the market that covers the issues of ASI. DISCLAIMER: If you are serious about playing in tune, you must get this book and read the ASI chapter. Who should read this book and learn about ASI? 1. Guitarist and bassists constantly battling tuning stability. 2. Guitarist who wish to record in tune. 3. Musicians who are meticulous about their guitars. "For many years, I thought all strings tune by turning the keys and adjusting the bridge...They don't! Thanks to your book, I now have a better understanding of how tuning really works." "For less than the cost of a set of bass strings, this book has changed my perspective on the basics of strings." "I thought only a few guitar string companies actually made their own strings, and the rest were other companies putting their brand name on the package. I was totally blown away to read how many companies actually wind their own strings. Amazing." "A must have book for students and pros. I have recommended it to all of my students." "I especially found the sections on ASI and String Makers to be interesting. Definitely worth the money." If you are new to the guitar and new to buying strings, don't worry. This little book starts with the basics. If you have been playing and studying the guitar for many years, don't worry. This book goes well beyond the basics and gives you a clear advantage in string knowledge over most other players. Get your copy today! Remember...Knowledge is power Knowledge is great tone. 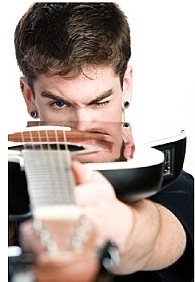 eBook Title: Think You Know Guitar Strings? Once your credit card is approved, you will immediately be given a special download page where you will be able to download the book. You will need Adobe Acrobat Reader to view the eBook. Copyright 2019 ProfessorString.com All rights reserved.